Every once in a while an ad comes along that restores your faith in advertising. That silences the negative voices who say advertising isn’t as good as it used to be, that no-one’s making good work these days, that clients aren’t buying great work any more. Cadbury’s Gorilla. Sony Balls. Ikea Beds. This is one of those ads. I’m proud to say that my mates Andy Flemming and Christy Peacock have created it, here at M&C Saatchi Sydney, with the director Hamish Rothwell. It’s a beautiful, epic campaign built on an insight that’s as relevant as it is poignant. World class craft comes through in every element, from writing to casting, cinematography to (wonderful) use of music. Getting it written, sold, shot and finished was a mammoth effort involving shitloads of hard work from a large bunch of very talented people. Please watch, share and be inspired. How do you fit in when you were born to stand out? I often find myself in conversations with fellow parents about our respective kids’ reading levels and what they like to read. I’m always interested in recommendations for things my boys will enjoy, stuff that will develop their love of reading. One of the best things I’ve come across in years is Wonder by RJ Palacio. Published in 2012, it’s spent three years near the top of the New York Times bestseller list, is loved by thousands of children globally and has inspired a growing movement which is taking hold in schools across the US. Having read it with my two boys, it’s gone straight towards the top of the list of our favourite ever ‘reading-together’ books, alongside Danny Champion of the World and the Mr Gum books. 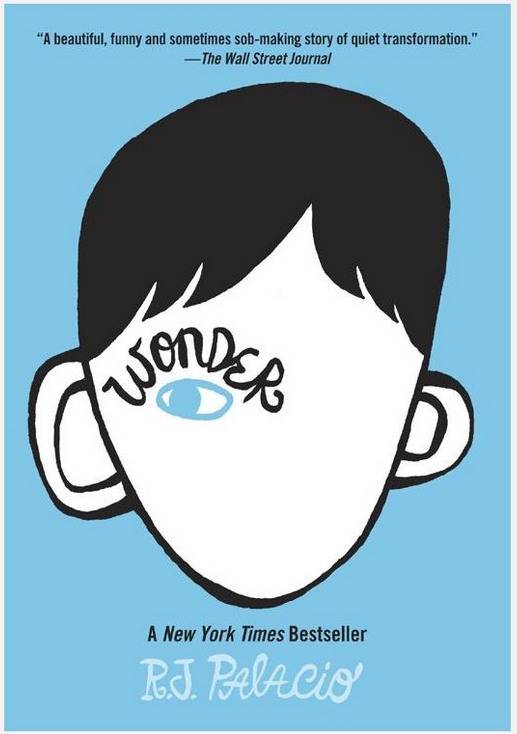 Wonder is the story of Auggie Pullman, a 10-year old with a severe cranio-facial abnormality caused by Treacher Collins Syndrome. Basically, his face is a cross between a badly burned fire victim and The Elephant Man. Other than this, he’s a smart, funny and totally normal kid. But, as you can imagine, he has his fair share of challenges; quietly fitting in simply isn’t an option. The book covers Auggie’s first term of ‘normal’ school – up until middle school he’s been home-schooled by his mum because he’s had so many medical issues (and his parents weren’t sure he was ready for other kids’ reactions to the way he looks). You know how every children’s book you pick up has big quotes on the cover with things like “Extraordinary!’, “Life-changing!”, “It made me weep then laugh then weep…then laugh some more!”? Well this one really is all of those things. The writing is clear, engaging and extremely insightful. It has a great handle on kids’ speech patterns, thought processes, the politics of young friendship and the highs and lows of growing up. It resonated powerfully with my boys; each night after reading it, we’d have a really rich conversation about the issues it threw up. I think author herself summed it up really well when she called the book “a meditation on kindness.” I’d go as far as saying that it’s brave and beautiful and that the more people who read it, the better this world will become. PS. I’d love to hear any recommendations for great children’s books. If you have any, please leave them in the comments/on Facebook if you’re reading this on there. Thank you. The first ketamine-inspired ad campaign of all time? You know the way people say ‘no-one reads long copy anymore’? Well, long form content is going the same way, right? Seriously, who’s got SIX MINUTES of their life to spend watching an ad? No-one. BUT…people HAVE got time to read/watch stuff that’s funny and/or interesting and/or useful. Which this work is. It’s SO different to everything else in the category. Weird, long, druggy and strangely compulsive viewing. And great use of a star to entertain/bamboozle rather than annoyingly spruik. Bold and brilliant. If you’re enjoying wallowing around in the K-hole, the second one’s here. If you’re in need of a little motivation, watch this and remember…YOU CAN MAKE IT!